Flood and storm damage if left untreated in the appropriate ways will lead to larger issues down the road including the health of your property and all humans who come in contact with it. 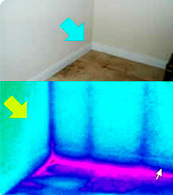 The onset of mold begins only 72 hours after the original damage caused by water. Dehumidification and structural drying are only two steps in preventing this silent killer from beginning to grow. We have seen thousands of homes go untreated for water damage from floods and storms over the years. Unfortunately, these homes have become infested with mold that has damaged the property and in some cases, has caused serious health issues to those present in the property. Don’t let this be your case. If your property is insured for water or flood damage, usually this covers mold clean-up at the time of the disaster but not in the future. So, not treating it right as water or flood damage happens, may leave you stranded financially if mold services are need in the future. Call our Flood Pros professionals who stand behind their work and efforts to prevent mold and have the experience, training, equipment that will leave you feeling confident about your property and your family’s health now and in the future.